Corsica packs a wealth of natural and cultural treasures, along with a low-key atmosphere that invites you to relax and to leave all your worries behind. Campo di Liccia is the perfect destination for holidaymakers who want to experience the best of a camping holiday in Corsica without giving up modern comforts. Treat yourself to a special sun and beach holiday in one of the most exclusive destinations in the Mediterranean and book your stay at Campo di Liccia with LUX-camp. Why camp at Campo di Liccia? A privileged location in the southern coast of Corsica and multiple opportunities for active holidays and gastronomic and cultural tourism. This luxury camping site is a family-run establishment where customer satisfaction and attention to detail come first. A dedicated children's play area is available to ensure that your family holiday offers something of interest to everyone. A varied programme of activities to keep you entertained from morning to evening. Luxury camping and first-class accommodation standards Campo di Liccia offers an excellent range of accommodation options suitable for couples and groups of up to 6 people. You can opt for staying in an air-conditioned mobile home equipped with all the amenities you would expect from a three-star camping site and surrounded by fragrant eucalyptus and pine trees. Beautifully decorated cabins and spacious chalets are also available. Make the most of Campo di Liccia's privileged location and take your time to explore Corsica's natural beauty. You will never be too far from Corsica's picture-perfect beaches, where crystal-clear waters and secluded coves flanked by imposing limestone cliffs dot this magical landscape. If you are after peace and quiet, the dense forests of southern Corsica make for the perfect day out, and if you are interested in discovering the cultural heritage of this unique island you shouldn't leave without visiting Porto Vecchio, Figari, and Sotta. At Campo di Liccia, you can find the perfect balance between staying active and relaxing. Quad rental, horse riding, canoeing, scuba diving, golfing, and kayaking are popular activities. With a boat rental you can leisurely explore the breathtaking beauty of the Corsican coastline. A well-equipped fitness centre and sports facilities are also available on-site. The younger ones will love the kid's playground and paddling pool, as well as fun activities like treasure hunts and crafts sessions that are organised every morning during the high season. 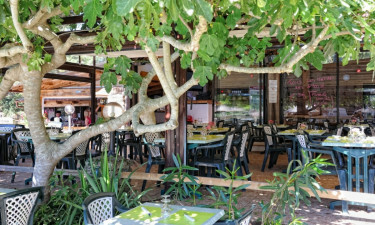 There's no need to leave the campsite to sample authentic Corsican specialties, like Campo di Liccia salad or Corsican pasta dishes. The on-site restaurant serves these and other dishes (as well as soft and alcoholic drinks) in a pleasant setting that serves as a meeting point for all guests. You will find every item needed for a camping holiday at the on-site grocery store, which is open throughout the day and sells everything from freshly baked croissants to toiletries. 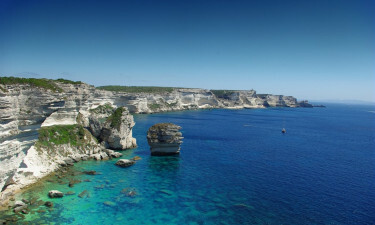 More shopping options are only 4 kilometres away in the charming medieval town of Bonifacio.